Three teachers. two cities. one mission. I have been thinking about this phrase a lot in the last few days. On Tuesday, we saw an exhibition by photographer and documentarian Anne A-R at L’institut du monde arabe (the Arab World Institute) called “I AM with them.” It featured photos and stories of refugees from the Middle East. The artist visited several refugee camps in Europe, roughly following the succession of camps one would encounter on the way to European countries. We have struggled a bit with word choice while here. In our school projects (and in our grant proposal), we refer to “displacement” frequently, using it almost as a synonym for “immigration.” I realize now we must change that language, using the more precise terms of “migrant” (someone moving for economic reasons) and “refugee” (someone moving for safety reasons). Throughout our trip, we have looked primarily at migrants - immigrants coming to France for work. The current refugee crisis, however, begs some of our attention; the experiences of these people cannot be ignored. I cried in the museum. If you know me well, you know that this isn’t saying much. But Mary Claire and Mike can vouch for the emotional weight of the photos and stories: 70-year-olds leaving their homelands; the individuals who have been injured in war and are carried by their friends across countries; people my age who left their sweethearts in Syria and know they’ll never seen them again; 12-year-olds who can express their hatred of war and hope for the future; toddlers who are somehow surviving freezing temperatures, illness and little food. The exhibit moved me in a way few stories about the refugee crisis have. To hear their own words, to look into their eyes, to realize how easily I could have been born into that life instead of my own - it’s hard to ignore the suffering. Because I’m no different from them. I simply live on a different piece of land. In the last ten days, we have seen a variety of perspectives on immigration in France: museums dedicated to the history of people along the Mediterranean and in Arabia, as well as the history of immigration in France; the Grande Mosquée of Paris; various immigrant neighborhoods and markets in Marseille and Paris; and the generous people we interviewed. Through all of these lenses, I still see my findings from a previous post. Our similarities are greater than our differences. 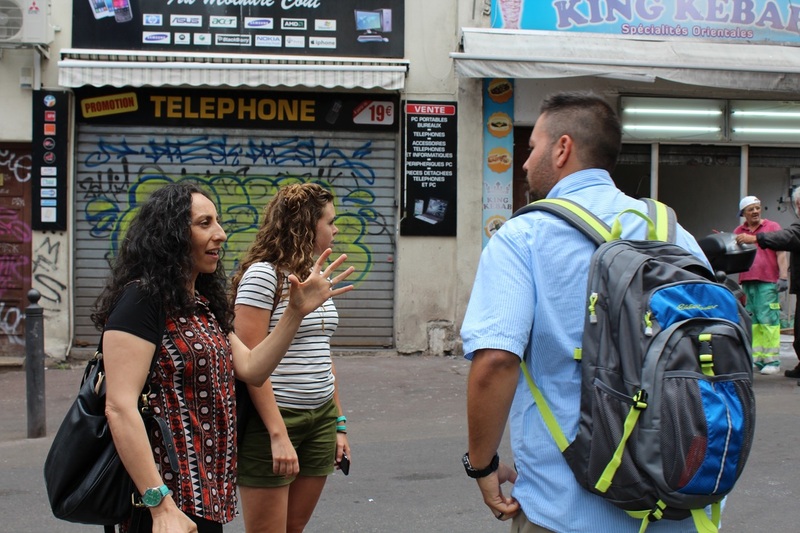 In the words of IAU College professor Yumna Masarwa, “I don’t care if you’re orange, blue, black, white or green.” She says she works to fight stereotypes and show her American students in Marseille just how similar they are to people who seem to come from another world. Yumna talked to us a lot about the “otherness” felt by second-generation Muslim immigrants in France. According to her, these self-identified “Beurs” are Muslims who were born and raised in France, who speak French and don’t speak Arabic, who have seldom or never been to the country of their ancestors, who embrace western values, yet who are still not accepted by French society. They are considered not fully French, perhaps reflecting their separation from or invisibility within the dominant culture here, despite wanting to be a part of it. Yumna said this ostracization leads to the feelings of hurt and animosity toward Europe, ultimately contributing to the tension felt between France and its Muslim population. And all of this makes sense. After all, haven’t we framed our project around this distinction between French society and French Muslims? It’s so easy to see the differences and the problems they cause. As someone who loves traveling to new countries, I enjoy getting to know cultures foreign to me and studying our differences. But I’m starting to feel like we too often focus on the differences - positive or negative - rather than our common bonds. According to Aboubakr Jamai, another IAU College professor, the media contributes to these divides. He called the current situation in France “poisonous;” Islam and France’s emphasis on secularism, immigration and terrorism are creating “perfect storm,” in his words, for the growth of extreme right-wing political rhetoric from the National Front. This anti-immigrant party has risen, in part, from the idea that Muslims and immigrants do not currently fit into the French identity. On Wednesday, we spoke with Simon, a Parisian native, who explained that France is facing almost an identity crises; do the French accept newcomers as they are, or do they force them to assimilate to French ideals (such as not wearing headscarves) in order to be considered French? Essentially, the French are asking themselves, Who am I? And who are “we”? We’ve seen these false divides even in the Euro Cup soccer tournament that has dominated our visit. The teams all have different colors, and we can differentiate the fans by jerseys on the street. Yet all of the chants and songs sound oddly similar and are even identical copies of what we sing at Sporting KC games. Our tunnel vision toward France – toward those who look and act like us – reflects the tangible connection between the United States and Europe. As much as Americans (and probably Europeans) might like to deny our bonds, the similarities are undeniable. In terms of immigration, our experiences here have shown that America and France are mirror images. History: Both countries saw immigration largely from European countries in the 19th century, which gave way to immigration from Central and South American, African and Asian countries in the latter 20th and early 21st centuries. Economic Factors: Economy largely propels migration, meaning we are more willing to welcome immigrants when there are plenty of open jobs, whereas we look less favorably on immigration during economic slumps. Borders: France relies on the Mediterranean Sea as a natural border. The United States has created its own border to control immigration from/through Mexico. At Musée national de l’histoire de l’immigration (the Museum of the History of Immigration in Paris), we saw an exhibit called “Frontières,” or “Borders.” The exhibit featured photos, documentaries, artifacts and many questions around the idea of borders – natural or constructed – between countries. Why do we create them? Why do we maintain them? What impact do they have on the people around them and those trying to cross them? The first section of the exhibit showed places in the world where man-made borders separate people: India/Bangladesh, Israel/West Bank, North Korea/South Korea…and the United States/Mexico. I felt embarrassed to have my country counted among those. Negative Attitudes toward Immigrants: This is a big one and the topic in which we first saw reflections of America in France. In the United States, we often, especially recently, respond to immigration with fear and resentment; we have seen this same pattern in France. And just as Donald Trump has used inflammatory, anti-immigrant rhetoric to tap into those emotions in the US, the National Front has risen in France. Are these movements different from those we’ve seen in past decades and centuries? Are these negative attitudes new or simply finding a (rather loud) voice? Dr. Carl Jubran, the president of IAU College, claimed that the reason the richest countries in the world (UAE, Bahrain, etc.) accept few immigrants and refugees is that they are “more honest about their racism,” insinuating that countries like the US and France struggle with immigration because we refuse to admit our own biases. The part of me who believes in the goodness of humanity desperately hopes we are better than that, but the deeply hateful rhetoric – and support of that rhetoric – scares me. This brings me to the phrase we saw painted on sidewalks, etched into schools (see photo above) and scrawled on walls across France: Liberté, Egalité, Fraternité – Liberty, Equality, Brotherhood. It’s the national motto of France and a nice post-revolutionary gesture, emphasizing the rights of the people and the importance of community. But is it real? Is it possible? Carl lamented that in the West, we lean not toward brotherhood but instead, away from each other. By “othering” people, we treat them not only as unlike ourselves, but unlike humans. I see this in the United States and in France. Can the French really claim the importance of fraternité while denying access to or acceptance of newcomers? It goes directly against the third leg of their national values. The cynic in me feels almost hopeless in the face of such réalités. But I can’t be a total cynic – otherwise, how could I be a teacher? The goals of fraternité and a borderless world cannot be achieved if we don’t work toward them. We need people to believe that they are possible and worth fighting for, and we need people to continue to break down the physical and metaphorical walls between us. Mike, Mary Claire and I strive for this in our classrooms, tearing down walls piece by piece. At times, the struggle seems too much and the progress too little, too slow. After ten days in France, though, I feel reenergized to continue to cross barriers and form connections between my students and me, and between the world and us. In doing so, we can really live up to my new ideal of “I am with them.” Because it is in those spaces of shared identity that we can build community. In my classroom, we spend a large chunk of time learning to write using sensory detail, or details that appeal to the five senses. I ask my students to show, instead of telling me, how something feels, tastes, looks, sounds, and smells. We work on writing something once, then going back to edit our vocabulary to make it feel more realistic. 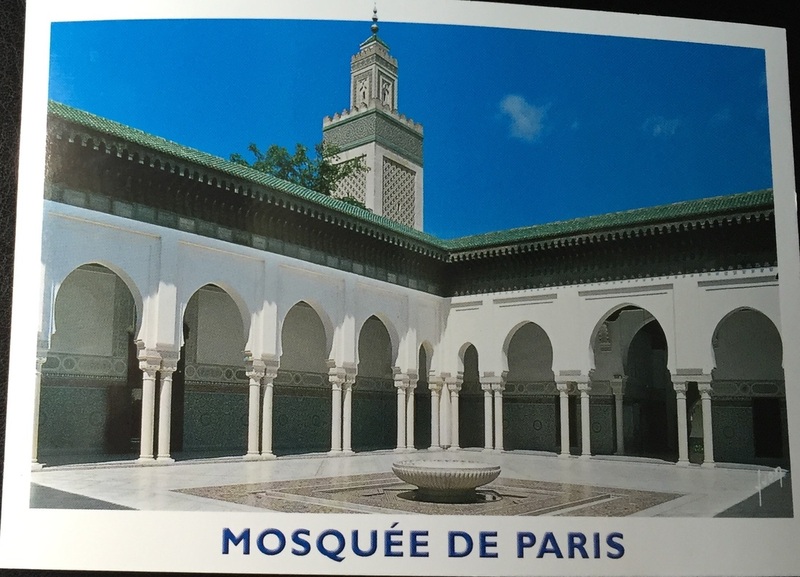 Sarah, Mike and I visited the Institut Musulman, Mosquée de Paris on Tuesday, June 14th. I wrote description of the museum using sensory detail. I first wrote this description in my notebook. I re-read, re-wrote, and finally wrote the final product on the back of a postcard I purchased from the museum. The guards in camo suits holding guns offset the white washed exterior. Green trees grow beyond the walls into the turquoise tiled rood. Heavy wooded doors mark the entrance with the inscribed words: Institute Musulman Mosquée de Paris. Decorative tiles in geometric patterns captives the eye to walls of navy, orange, turquoise, brown, yellow and blue. Its as though you are walking through a lush garden, until you remind yourself the sea foam green tile is cold to touch. 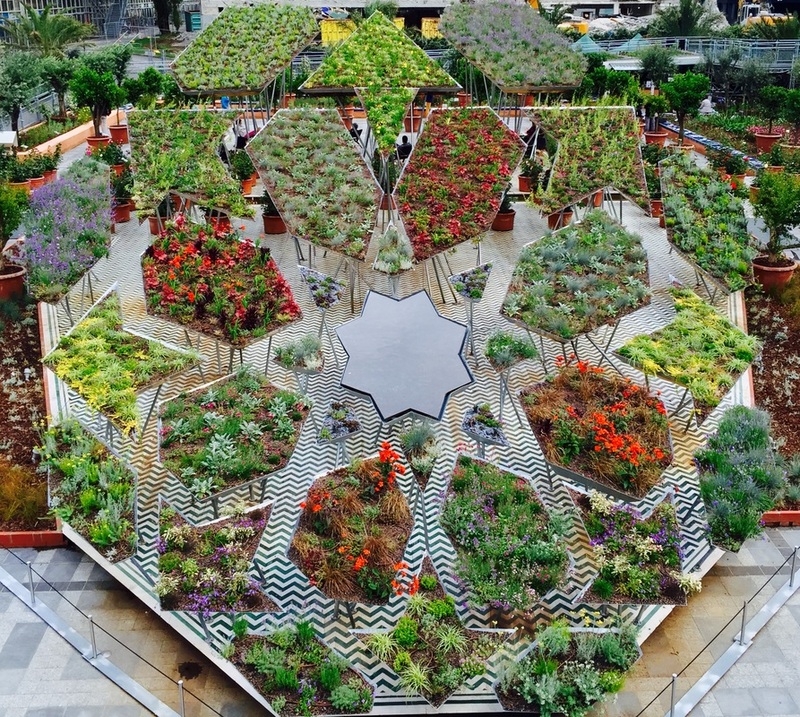 The echoes of prayers hymn through the exotic courtyard in the 5th ard. At 2:10PM, the sounds of unison break. There is a clatter to find one's leather shoes before returning to work. The feel glide through the icy tile back to a secular city. 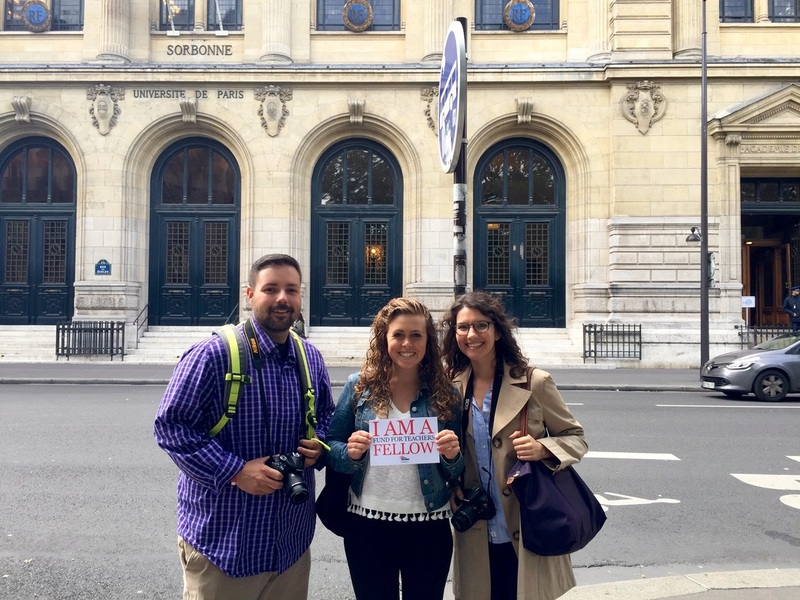 Mike Meaney, MC Gustafson, and Sarah Giesler in front of Sorbonne, Universite de Paris. Did you know that attending a university in France can cost students about 500 euro a year? Today, Mike, Sarah, and I spent eight hours touring the Musée National de l'histoire de l'immigration, the grande mosque of Paris, and the Institute du Monde Arabe. We are still processing all of the information that we possessed throughout this short day. Please stay tuned as tomorrow we have set aside long blocks of time to write, on our last full day in Paris. 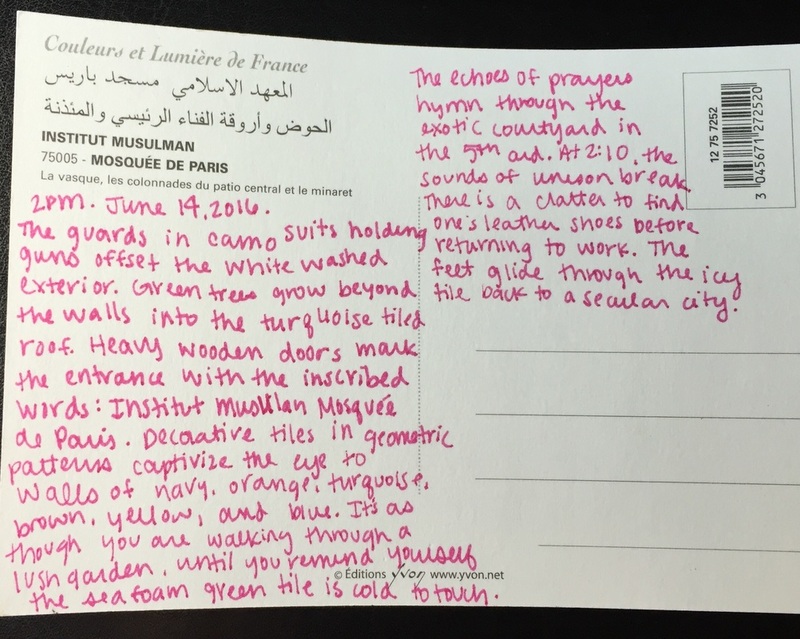 In the meantime, I have written a poem based on our experience at Musée National de l'histoire de l'immigration. We are bound to migration. For fear of being shocked. Above is an anamorphic image. "Anamorphosis is a trompe-l'oeil art form that alters the rules of perspective. Used since the Renaissance, it uses optical effects to modify our spatial perception. The object in question, subjected to anamorphic distortion, can be seen with its original proportions when watched from a certain vantage point" (Institute du Monde Arabe 2016). Seven months ago today, France and the world watched in horror as extremists terrorized Paris. And today, two days after hearing of the attacks in Orlando, I have thought a lot about what I’ve learned in the 213 days since I learned of the Bataclan. Throughout our trip, we have focused on the experiences of immigrants and Muslims in France, identifying with those perspectives and feeling outraged at the anti-immigrant rhetoric in France (and its mirror image in the United States). Much of that rhetoric stems from the terror attacks here. And while we still condemn that reaction, the last 24 hours have been a sobering reminder of what happens when people feel ostracized from society. This morning, we traveled to the Bataclan, one of the sites of the attacks in November 2015. The building was covered in scaffolding and plastic sheets, and the café in front of it was locked up, partially hidden by a tall fence; traffic barricades were set up around the area. Sounds of construction came from inside - the whir of saws and hollow drops of hammers drifted our way. Aside from the construction and coverings, it looked like a typical Parisian café and street - cute, but unremarkable. Yet the dark windows and empty chairs seemed to scream silently of the horrors of seven months ago. And today, as we stared into this still-open wound in Paris, those same horrors screamed at us from across the Atlantic. Like the hearts of many, mine hurts. Just as it did after the November attacks seven months ago at the very street - the very normal, if under construction, building - that I stood across from this morning. Just as it did when I flew into Newark last week and saw One World Trade Center, remembering for a few minutes the pain of that day and the ensuing months (and years). Just as it did when Mary Claire, two others and I visited the Oklahoma City National Memorial in March, driving home from Texas. In recent months, I have seen various stages of terrorism: immediate aftermath of tragedy on the news, seven months later as construction begins, 15 years later as we defy extremism, 21 years later as we quietly reflect on the lives lost, the lessons learned. And in the last eight days, we have thought and talked and learned a lot about what happens before all of those stages: the struggles that can sometimes lead to hatred and even extremism. This is what makes me not give into that powerful rhetoric against immigrants, against Muslims, against any given minority community that threatens the powerful status quo. When we criticize people, when we see people as “other” and give them fewer rights, when we demonize people, when we dehumanize people, we destroy the connections that make us humans together. So in spite of the horrors in Orlando, in Paris, in New York, in Oklahoma City and in countless other places, I refuse to give into the knee-jerk hatred that could be the oh-so-easy choice. I choose to see our similarities instead of differences, to make connections rather than to back away. If I’ve learned one thing from this trip, it is the undeniable importance of our common humanity. This work of humanizing other worldviews has never seemed more important. The Euro Cup is kind of a big deal. ​It is widely believed that sports bring people together. 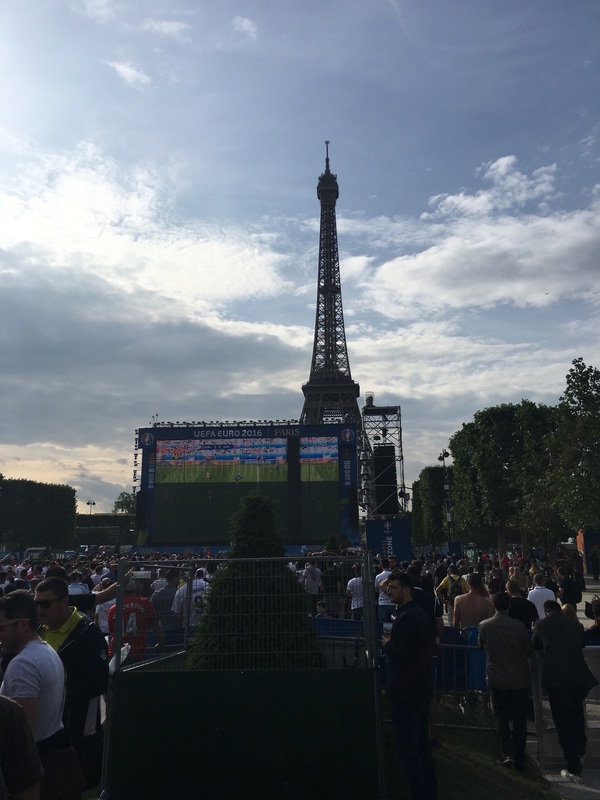 From my experience in France during the 2016 Euro Cup that is not always the case. Prior to our departure I decided to research what would be going on in France during our stay and found out that the Euro Cup was going to be taking place throughout our entire time in France. I learned that it was to take place in 9 different French cities (two of which we were scheduled to be staying in – Marseille and Paris). Then I proceeded to ask some fellow co-workers about the Euro Cup, mainly due to my ignorance of European soccer (or soccer in general). They assured me it was a big deal and that “I have to go.” For our purposes, the only thing I really cared about was how this would affect our trip. And so far, it has dramatically. Upon our arrival in Marseille last Tuesday, we didn’t really notice anything unusual. Then as each day crept closer to the opening kickoff between France and Romania on Friday, more and more people were visible on the streets of Marseille repping their countries’ football jerseys, flags, hair color, and face paint. By Thursday it was normal to see a group of young men chanting their country’s anthem with a pint of beer in their hand as passers-by stopped to snap a quick photo. The energy continued to increase day after day, match after match. Now, it would be unusual to walk a block in any direction and not see someone wearing a football jersey or a flag draped around the shoulders of a young man eagerly awaiting the next match of the day. We got to our apartment in Paris around 2 p.m. on Saturday and decided to walk to the Eiffel Tower. We heard that there was a watch party but were unsure as to what exactly that meant. As we neared the ‘fan zone’ (two blocks from the Eiffel Tower), we were greeted by the French military who searched our bags and patted us down. This happened twice more before we were actually allowed in to watch some soccer. We all agreed that the security was extreme but that it made us feel safe. Prior to our leaving we were warned to stay away from crowded areas. However, I felt safer within that parameter than anywhere else we had travelled. The crowd was not nearly as boisterous as I expected, and we all enjoyed the atmosphere as we watched Wales play Slovakia on huge LD TVs with the Eiffel Tower in the background. Although this electric atmosphere has added to our experience in France this past week, it hasn’t come without a few mishaps. On Thursday of last week, the area in which we were staying (Vieux Port) was invaded by rambunctious, inebriated, shirtless Englishmen who had two days to kill before their team actually played. As a pastime, they decided to do, well, what most college-aged young men would do: party. All was good until bottles began flying at police in riot gear attempting to calm the situation. This event led to teargas being deployed Thursday night, Friday night, and yet again on Saturday night. England’s match against Russia took place Saturday night and ended in a 1-1 tie thanks to a goal in the 92nd minute. Soon after the match ended, Russian fans rushed the English fans creating a brawl that would leave 35 injured. Apparently, the Europeans don’t embrace the aforementioned ideal of sports bringing people together. 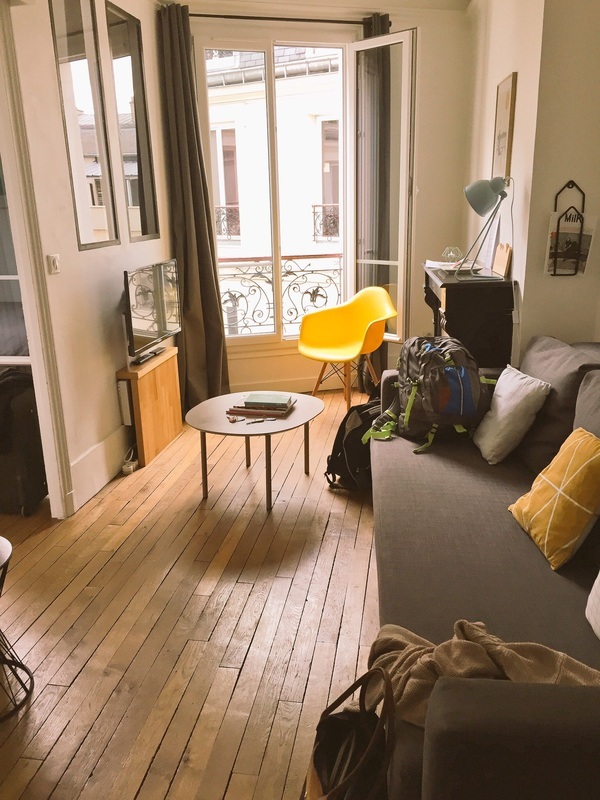 Now, as we approach our last three days in France, we’ve grown accustomed to the random chants while walking the streets or as groups of men walk past our apartment building. Needless to say, this experience has been both precarious and intriguing all at the same time. Although this tournament brought people together from all over Europe, there are two things that are certain: some friendly (and not so friendly) banter and a single winner. British fans (above) taunted French police (right). As we were planning to come to France, our families, friends and coworkers were really excited for us. We grew nervous about terrorist attacks, but everyone else stayed optimistic. As our departure neared, however, others started to mention their concerns. They nodded when we mentioned our nerves, posted articles on our Facebook walls about the things going on in France - and there were many things: terrorism, striking transportation workers, floods, the Euro Cup drawing thousands of soccer fans from around Europe to Marseille and Paris. “We’ll be fine,” we assured ourselves. This was all probably overblown. It all seemed silly once we landed in France. Everything about our trip has gone smoothly (save Mike’s lost bag the first day, but all good there). Last night, the Euro Cup began in Marseille. 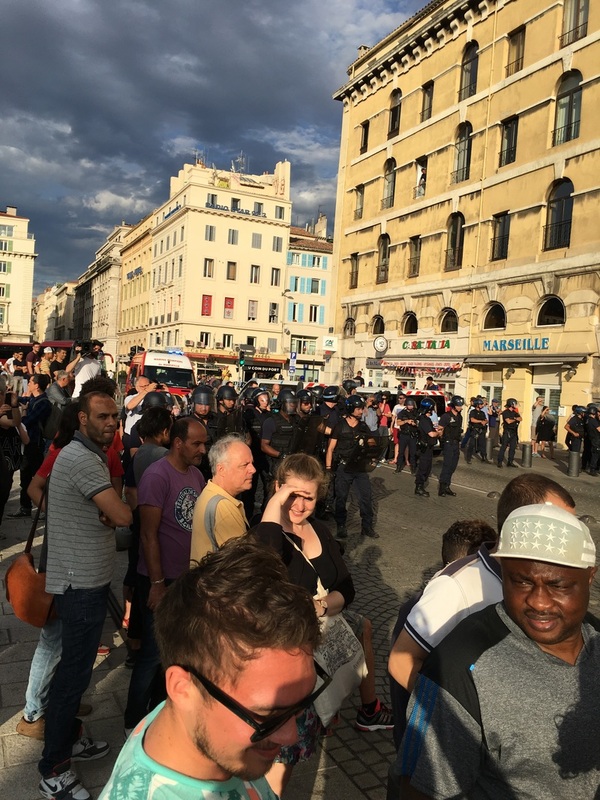 And as we wandered home from a delicious Turkish dinner, we watched as drunk British soccer fans lobbed fight chants and empty beer bottles at French police decked out in riot gear. We stayed long enough to hear a few songs before returning to the safety and quiet of our apartment to watch the game (and before the police released teargas on the crowd). So that was interesting. Mike and I had to basically drag MC away from the “adventure” (her word). Still, we stayed out of trouble (a nod to my parents and Mike’s wife). This morning, we packed up and Ubered to the train station, where we were entirely too early for our train to Paris. It wasn’t on the board of upcoming departures, but we didn’t worry about that until after breakfast and coffee. Then we worried. According to the official-looking man MC spoke with, our train to Paris was cancelled due to the strikes. Not to worry, he said. Our tickets were still good; we could board a different train to Paris but wouldn’t be guaranteed seats. As we boarded that train and grabbed some empty chairs, we worried about a host of possibilities: they would check our tickets and kick us off; at each of the next stops, we could get thrown off; there wouldn’t be enough seats and we would have to...stand? for the three-hour journey. It turned out (of course) okay. We made it to Paris in one piece. Two Metro rides, five flights of stairs and ever-more cups of coffee later, we are home in the City of Light. ​Paris: We can’t wait to see what you have in store for us. Our focus for this trip is on the experiences of people we are calling “displaced,” but after today, I’m wondering if maybe we should instead use the adjectives “separated” or “hidden in plain view.” We traveled an hour from our Airbnb to immerse ourselves in a different neighborhood, only to come back to the center of Marseille and discover that the communities we were looking for are located just a few blocks away from where we’ve spent much of our time in this city. As Mary Claire put it, today was a big day. This morning, we traveled to the outskirts of the city (the last stop on the Metro) to go to the Marché aux Puces de Marseille: the Flea Market of Marseille. A friend - shout out to Kristin Werp - who traveled here a few years ago spoke of a market featuring many vendors from Africa, and after some Googling, it seemed surely this was the place she went. An hour away from our apartment, after leaving the Metro and walking down some off-the-beaten-path streets, as well as some very industrial roads next to a highway, we wondered how Kristin had “happened” upon this market. The flea market was impressive. Similar in size to the City Market in Kansas City, we walked first by vendors selling used goods, then wholesale new items and finally fresh food of every kind: fruits, vegetables, fish, spices, nuts, baked goods and the largest garlic I’ve ever seen. Most of the vendors and many of the customers were Muslim, and we considered trying to interview them; in a commercial setting, though, it was clear that wouldn’t be the best way to hear someone’s life story. As we walked away the flea market, dodging cars and dumpsters and running across streets busy with large trucks and few crosswalks, we talked about how this community of immigrants, Muslims and people from lower socioeconomic classes was located so far from the city center, visible under the mountains in the distance. Why was this flea market so diverse and yet so inaccessible to people in the city? Two days ago, Dr. Carl Jubran told us that, contrary to many European metropolises, the slums of Marseille are located in the middle of the city. While that might technically be true, this hardly feels like the center. After all, we had to go to the last stop on the Metro, signaling that at least some forms of public transportation gave up at that point. Why is this lively spot so separated? We headed back toward the Vieux Port (the Old Port) to meet with one more professor from IAU College, Yumna Masarwa. True Americans, we grabbed coffee with her at Starbucks (her suggestion). Born and raised in Israel, Yumna studied at Princeton and has lived in Paris and Marseille; she teaches about Muslims in Europe and relations between people of Jewish, Christian and Muslim faiths, among other subjects. We covered a lot of territory with Yumna in that Starbucks: demographics, history, politics, generational differences, identity, terrorism, you name it. We have felt like we’ve seen a lot of Muslims here, and we were right. One in four people in Marseille is Muslim, yet they have no mosque - only prayer rooms scattered throughout the city. Now we’re getting to the “hidden in plain view” part. We left Starbucks, and Yumna gave us sort of a lightning-speed tour of the city center of Marseille. She pointed out a prayer room set off from a main road, marked with a small sign above the door. People were leaving the building after their Friday afternoon prayer. This room was nearly invisible to us, yet the doorway was piled high with shoes removed for prayer. She took us down several alleys, through upper and middle-class shopping districts. The port within earshot, we turn down a street that held many of the same types of vendors we saw at the flea market this morning: produce, meats, fish, spices. (This was clearly the market Kristin had found when here several years ago.) It is only a couple of blocks from where we’ve eaten several meals over the past few days, but once again, it was invisible to us. Instead, we have seen the upscale seafood restaurants, the souvenir shops, the churches, the museums, the residential streets of Marseille - but we were missing (at least) a quarter of the culture in this city. It’s so easy to see the differences among people and the problems they cause. As someone who loves traveling to new countries, I enjoy getting to know cultures foreign to me and studying our differences. Now, I’m starting to want to look more at how we are similar. At Alta Vista High School in Kansas City, Missouri, we teach language arts, journalism and social studies. We travel to France in June 2016 to conduct interviews and create texts around displacement and community for our students.